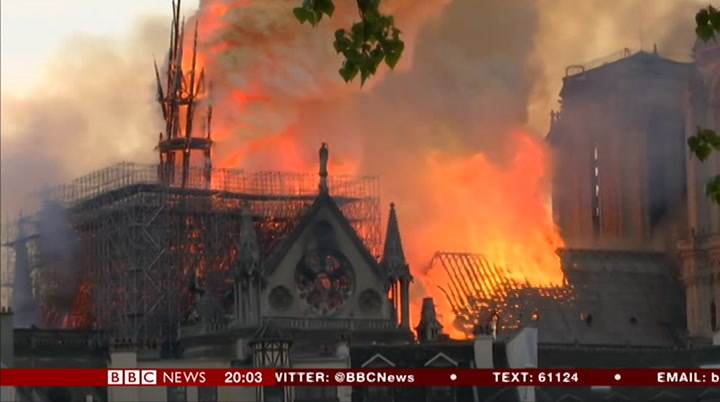 magnificent gothic cathedral was engulfed by a huge fire forth of hundreds of millions of euros have been placed here and around the world to rebuild the structure to its former glory. 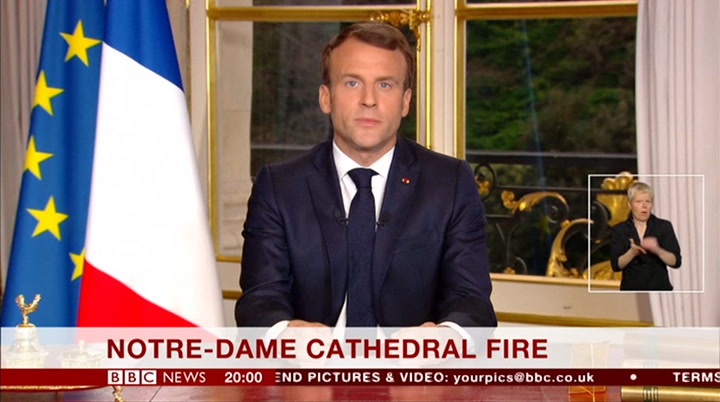 the french president emmanuel macron tonight address the people of paris and far beyond and said that notre dame would not just be beyond and said that notre dame would notjust be rebuilt, but rebuilt even better than before. and all within five years. in a moment we will hear more of what the president had to say. 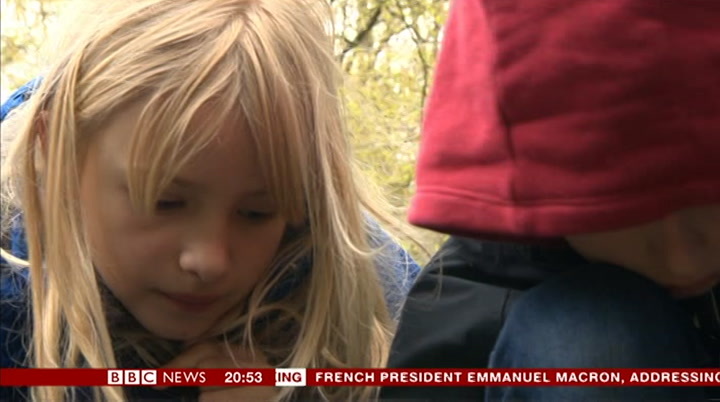 but first, this report on the latest development from our paris correspondent lucy williamson. words were hard to find last night to describe this loss. to absorb this scene. what burned with notre—dame, high above the paris skyline, was 800 years of history. 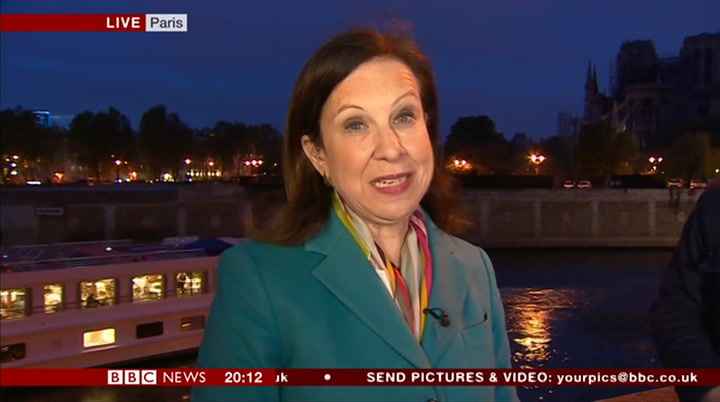 for some, the physical anchor of paris. the cultural soul of france. it took 23 minutes to confirm the fire alert and send emergency crews to the scene. the fire was spreading quickly. oak rafters that held the roof for centuries turning to ash in the evening sky. 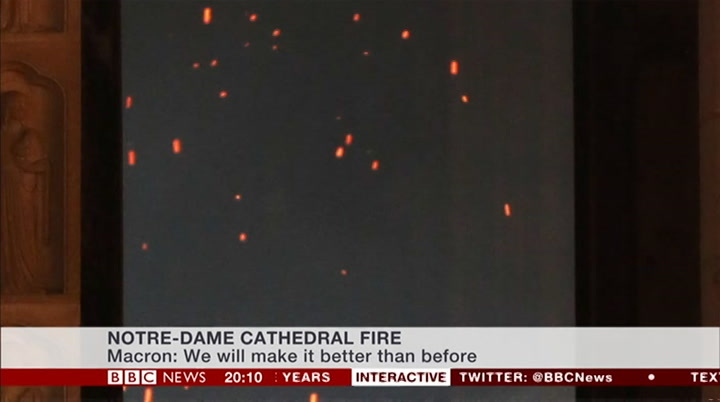 400 firefighters circled the cathedral, their cranes just stretching to reach the roof. 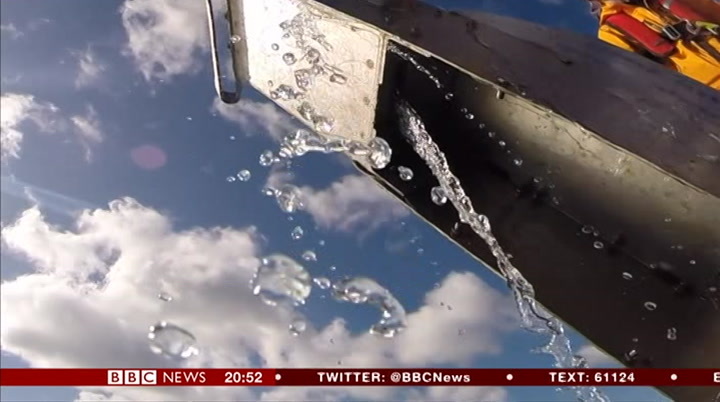 the risk that water would damage whatever the fire had left behind. 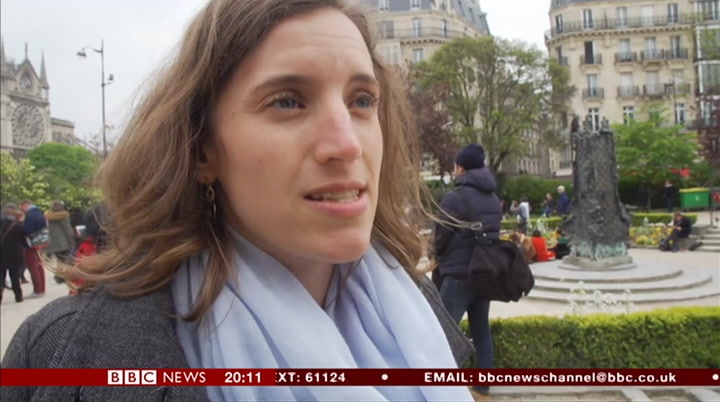 along the banks of the seine and surrounding streets, people watched, barely speaking. their awe familiar to pilgrims through the centuries, not their grief. 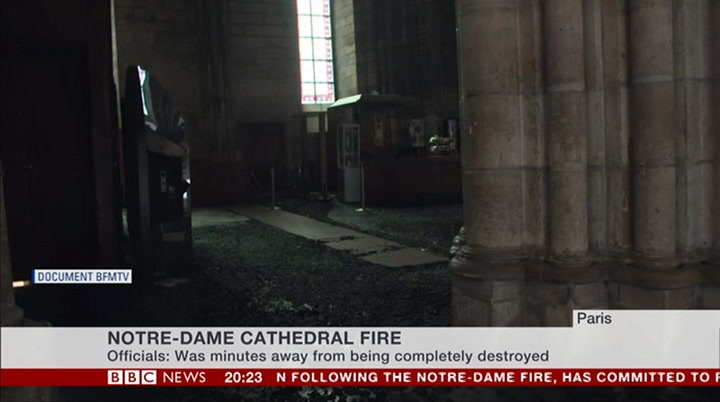 they watched the fire engulf the cathedral‘s central spire. its bell hanging clear and still in the slippery flames. and then this. but you know, it was impossible to save the big ones. france's president came like many to gaze in silence at a global icon fighting for its life. 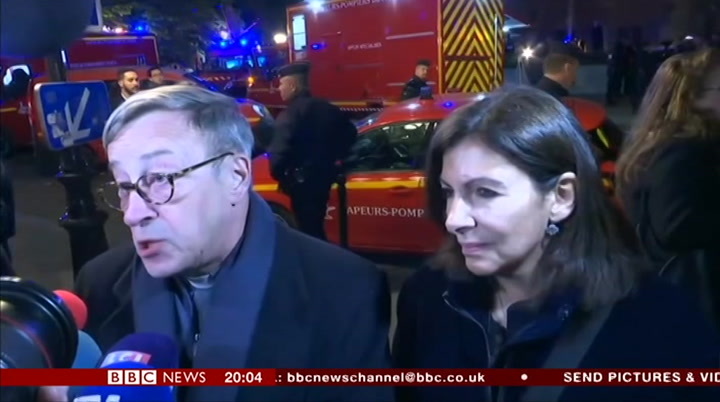 his first words were, he said, a message of hope to citizens across france. after four hours, firemen confirmed that the structure of the building had been saved. 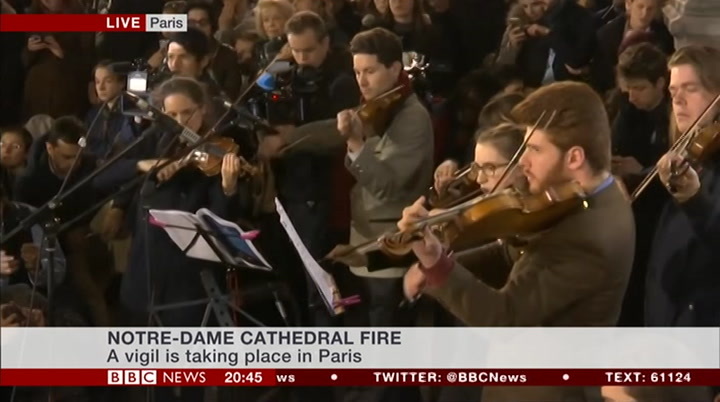 a test of faith for modern day paris. 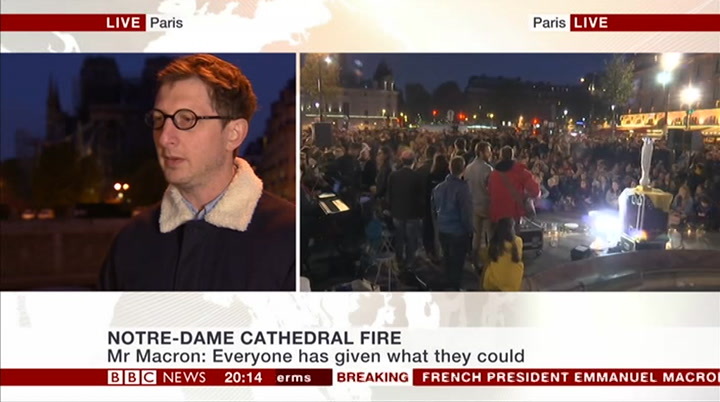 "notre—dame resisted the nazis", one resident said, "she is not going to leave us now." last night was all what about had been lost. this morning the focus was on what survived. 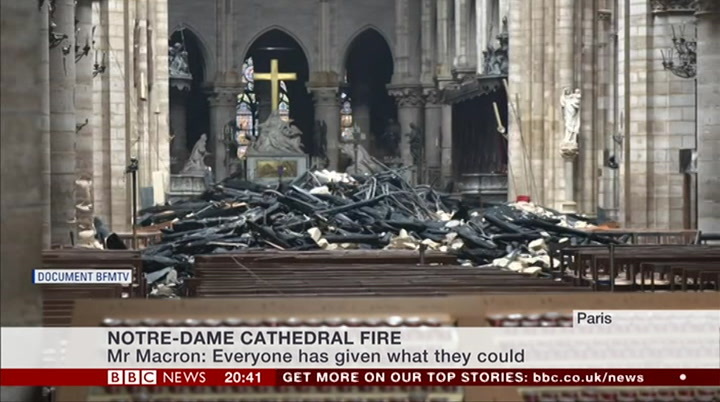 the fire burned through most of the roof, but the stone structure and many of its treasures have been saved. 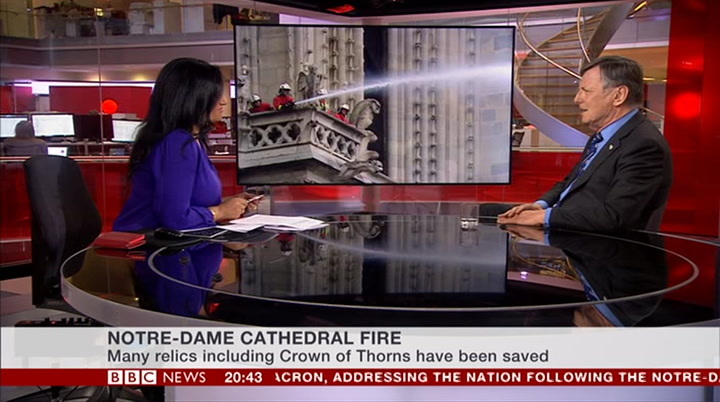 including the crown of thorns some believe was worn byjesus on the cross, several important paintings, the cathedral‘s medieval organ and the famous rose windows. these photos were taken by one of the architects invited in to assess the building. 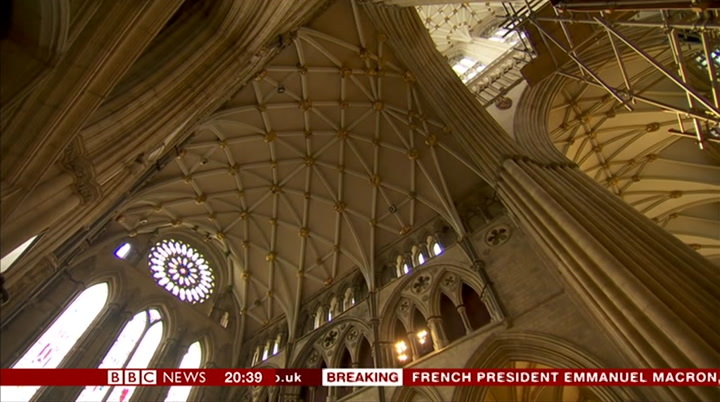 so with the vaults on one side, the walls and the flying buttresses around, so normally it should be stable, but i know they are going to investigate to see if there is some risk or not for the building itself. people came again today as if for reassurance. counting the damage, weighing their relief. translation: it is such a shock. i am discovering it now. it is a symbolic building for us. it still is. it always will be. you don't understand, you don't get it, how can that, that kind of thing can happen right now? it is impossible to accept that, so you just... for the life of all the parisians and even in europe, and in the world, it's, it exists as a symbol and we need it. 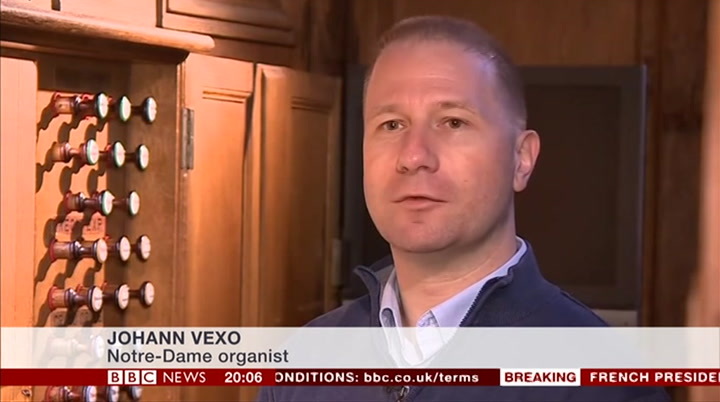 the cathedral organist, evacuated from the building last night, still hasn't been back. it's like a part of my life, which is destroyed. i think it will be hard to see, so i am a bit afraid about seeing it over the next few days probably. but, yeah, i'm totally devastated. investigators are working on the basis this was an accident. the fire is thought to have started on the roof. 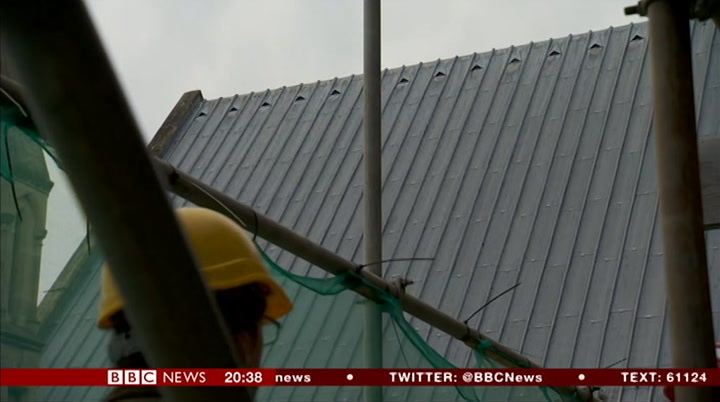 many have questioned whether restoration being carried out on the building might have played a role. that restoration is now a much bigger project, and donations have poured in overnight. 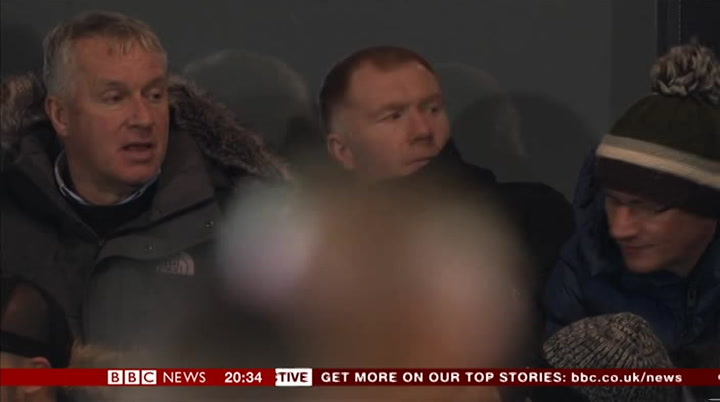 hundreds of millions of pounds so far. this is where france kept not just its relics, but its stories. a place to mark both heroism and loss. 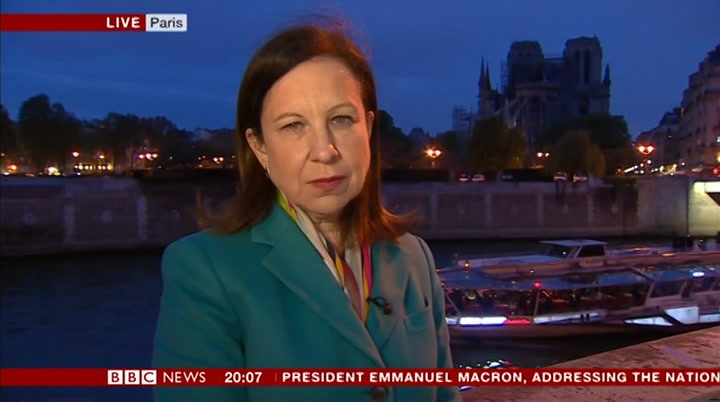 those two things were felt here again last night, a new chapter in the tale of notre—dame. 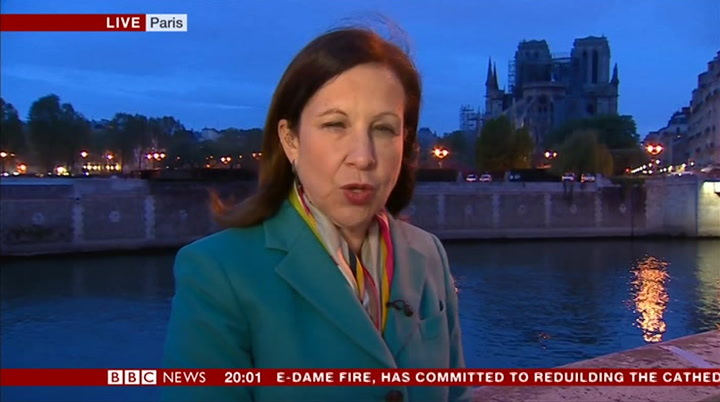 lucy williamson, bbc news, paris. this is the scene tonight. a vigil which began about an hour ago at the church not far from where we are broadcasting from. a visual of song, and prayer. and a tribute to this magnificent cathedral in the heart of the city that means so much to this city. 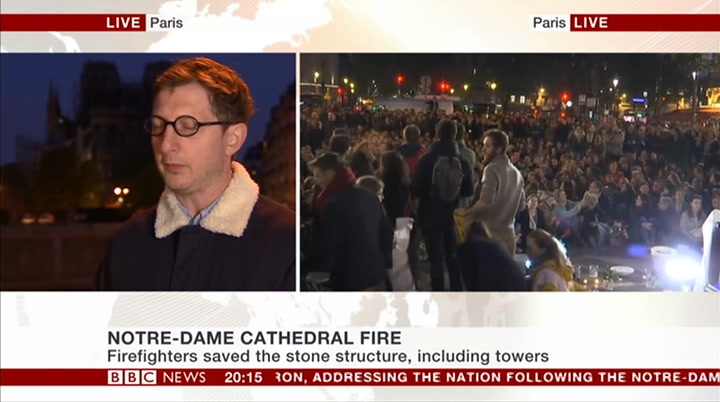 a slow and solemn march towards the cathedral, a cathedral thatis towards the cathedral, a cathedral that is broken tonight, but still stands so beautifully on the banks of the river seine. as it has done for nearly nine centuries. and every body has given what they could. each according to his role. 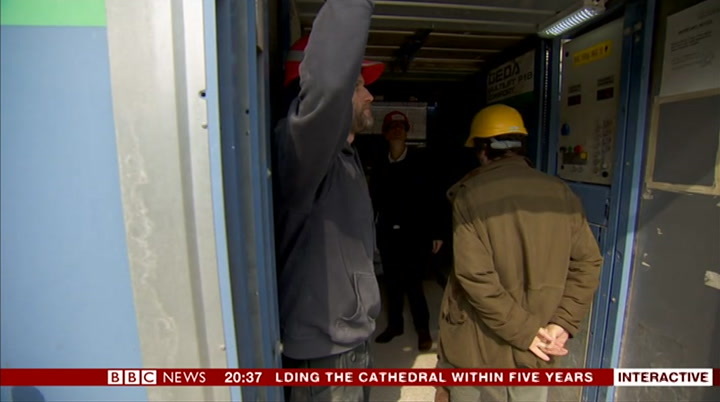 and what i want to say this evening is that we are people of builders. we have so much to rebuild. 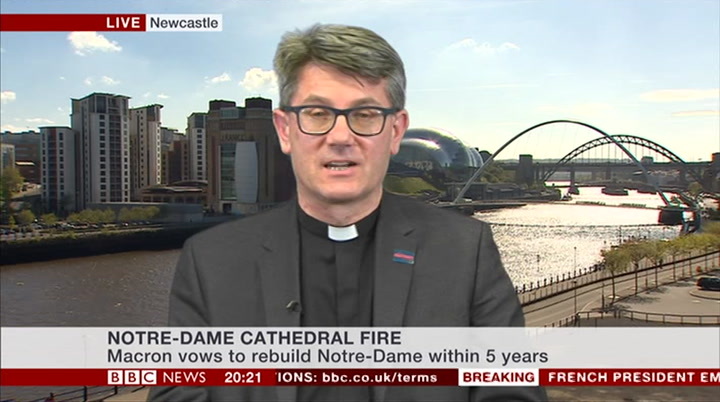 yes, we will rebuild the cathedral of notre dame and make it even better than before. 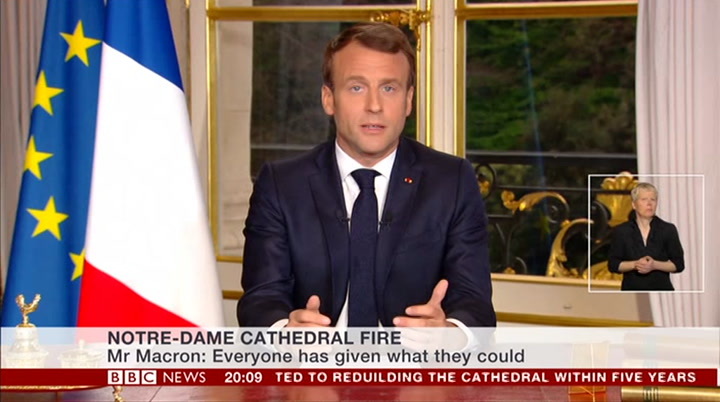 it is so clear to all now that there isa it is so clear to all now that there is a special place in the hearts and the people of france for the cathedral and of paris. 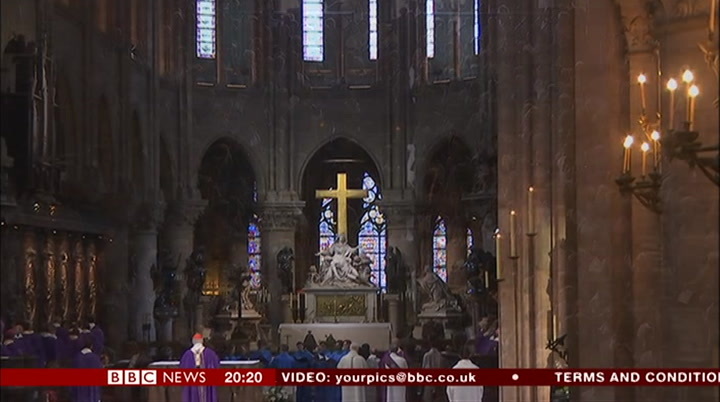 a symbol of tradition, culture and christianity, fergal keane reports on its importance to the people of paris. "to everything there is a season, a time to break down, a time to build up." the biblical text so resonant when that that has stood for centuries is broken by fire. in the lives of paris, this has been a day of solemn reflection. 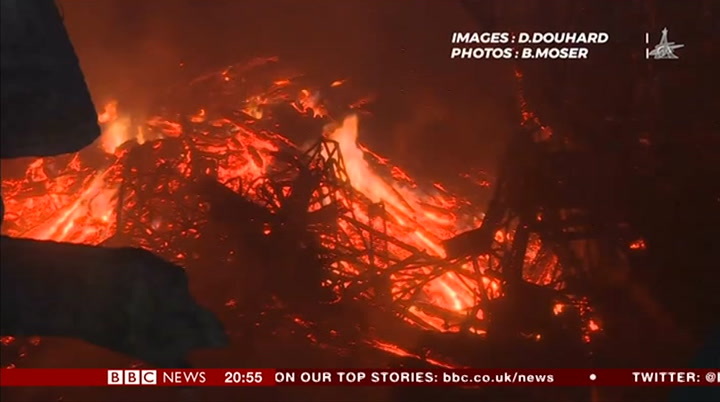 father philippe filmed the flames as the fire took hold. he was ordained in the cathedral and has worked there for decades. 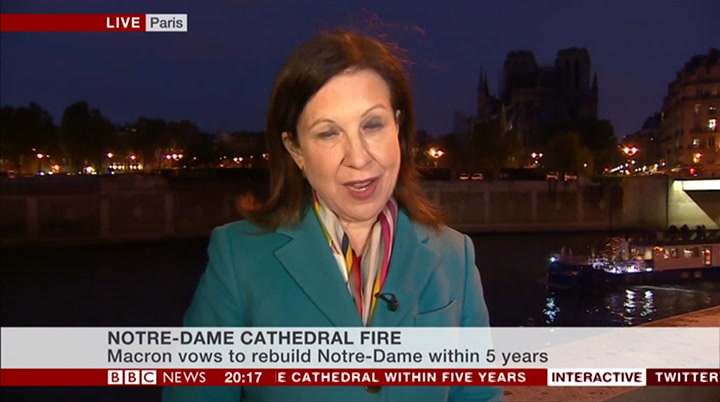 "notre dame is my mother, he told me. "i came into the spiritual life because of her. 31 years ago, i was ordained here. today, my mother has been burned. she cries, but she still stands." yet to see what's happened as only a french loss is to misunderstand the meaning of this city, the universality of its treasures. francesca is a german who lives in paris because as a teenager, she visited notre dame and was enchanted. today, she could feel hope and renewal. it reminds me, somehow, that the church is not stones, it's not only culture. for me, it's a living community, actually. it's the people who go to the church who are at the very core of our faith. so we are believing in hope being stronger than destruction and in life being stronger than death, and life that will, eventually, win. for generations, artists have sketched and painted on the banks of the seine. lauren was here this morning to sketch the old spire from memory. he's not a religious man but he is a proud parisien and through his art wants to give shape to what might rise once more. "i am sad, but we are going to fight back", he says. "we will find wood in the french forests and we will build again. i can see the stained glass is still there, it is magnificent. it will be all right." 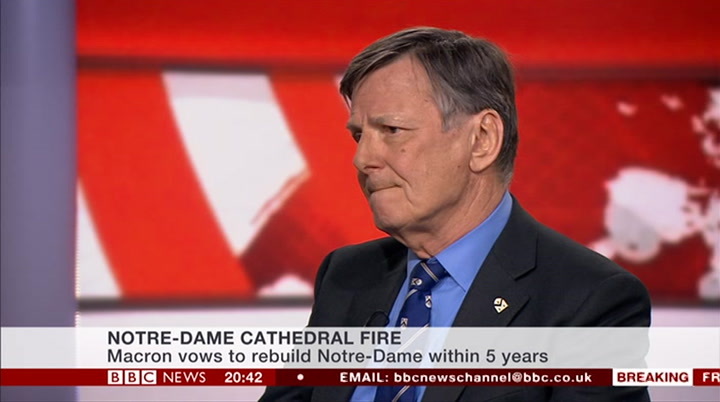 there is no doubting the loss, but neither of the determination to raise again the glory of notre dame. 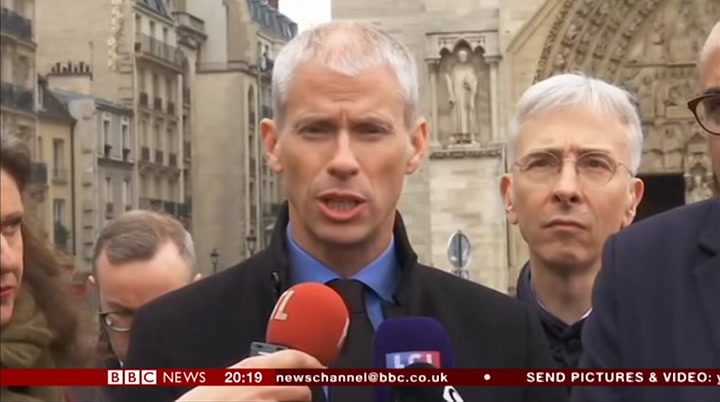 fergal keane, bbc news, paris. stable, it built 200 years ago, we will have to build that again. when you first heard that there was a fire that erupted on the roof, what was your first reaction? we were not told about it. 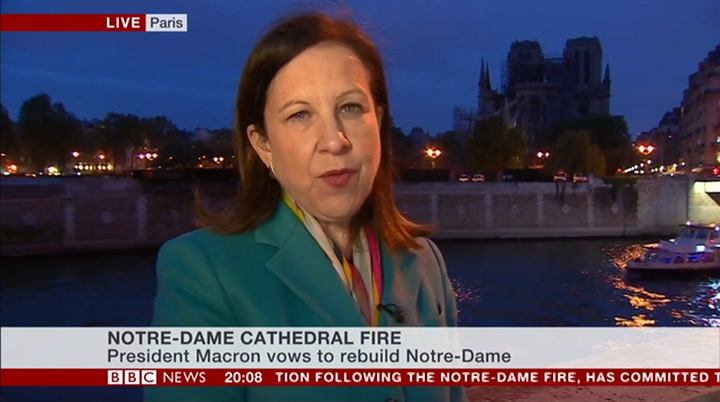 i saw it because the mayor of paris and myself have our offices in separate buildings but but most of our buildings are facing the cathedral. so we saw the smoke and went straight on. we couldn't watch it. immediately, we were trying not to really let in the despair and act and we took prompt decisions, they may decide immediately to open city hall. —— the mayor decided to force up and we moved the stuff out, although the treasuries and beautiful art pieces out of the cathedral while the firemen were fighting and fighting tough. they were fighting all night. us communities as well as donating to us when they come to visit. but i think if all the money got sucked in toa think if all the money got sucked in to a few small projects, that would be to the detriment perhaps of these poor communities are less advantaged ones. six or 700 million already pledged for paris we are hearing. thank you, reverend forjoining us. 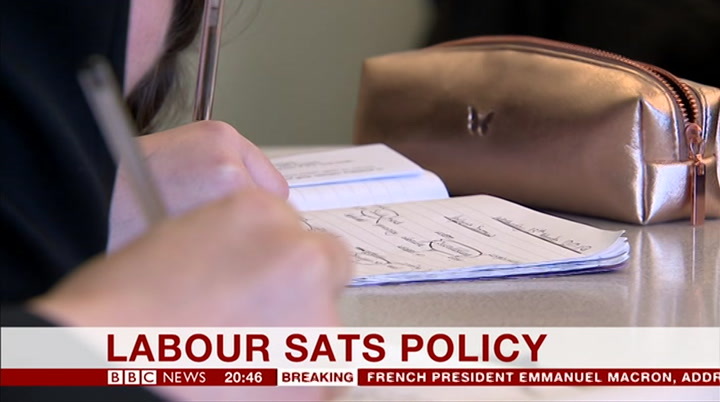 labour have announced their plans to scrap the national primary school tests known as sats in england. 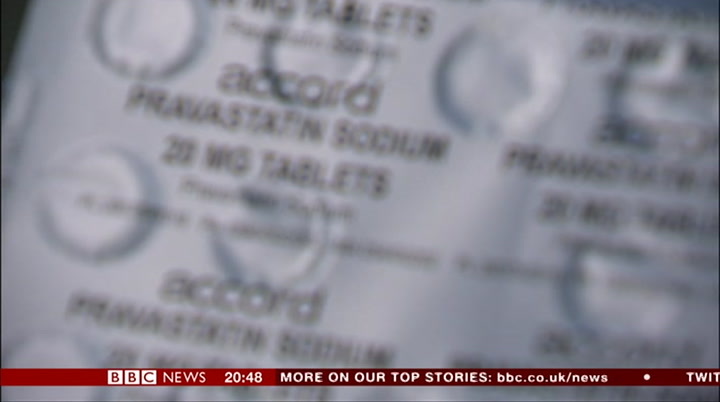 the labour leaderjeremy corbyn said the move would end what he called the "regime of extreme pressure testing". 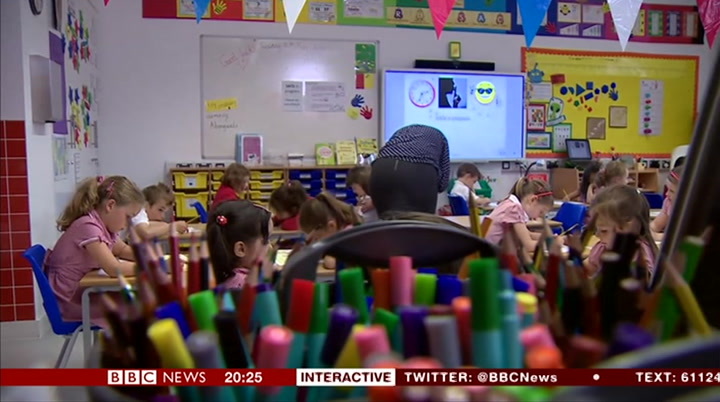 children in england take the tests at the end of primary school. and there are curently tests before that — at the age of six or seven — although these are already due to be scrapped in 2023. the tests — in grammar, reading and maths — measure what pupils can do and their progress. 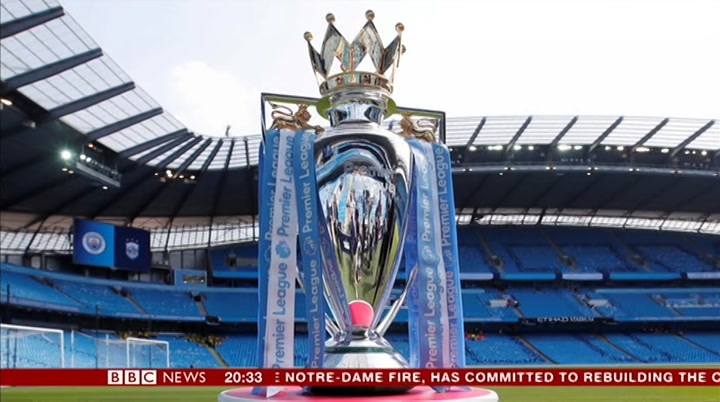 from liverpool, our education editor bra nwen jeffreys reports. 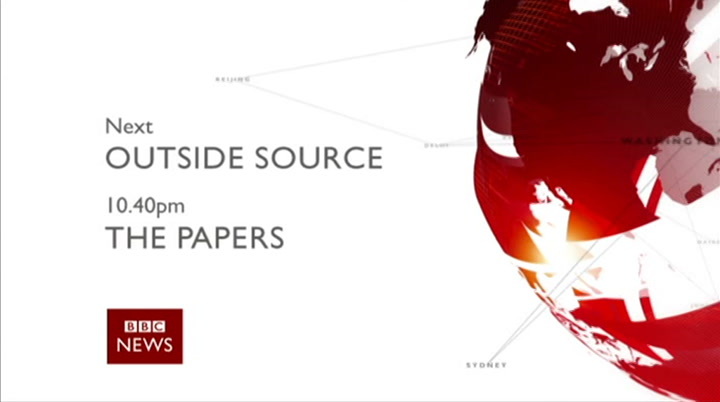 and many others — are covered in tomorrow's front pages at 10:40 this evening in the papers — our guests joining me tonight a re nicola bartlett, political correspondent from the mirror and political strategist jo tanner. 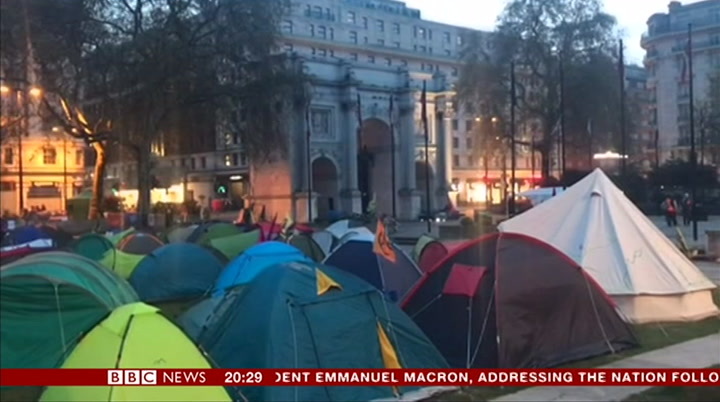 the metropolitan police says more than 80 people have been arrested, on the second day of climate change protests, in central london. 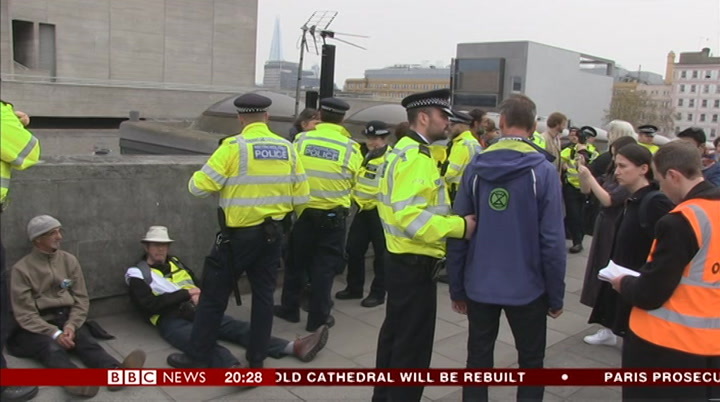 campaigners from the extinction rebellion group have continued to block roads including on waterloo bridge at oxford circus and marble arch. they say their demonstrations will continue in cities around the world, until their calls for urgent action to cut carbon emissions are heard. 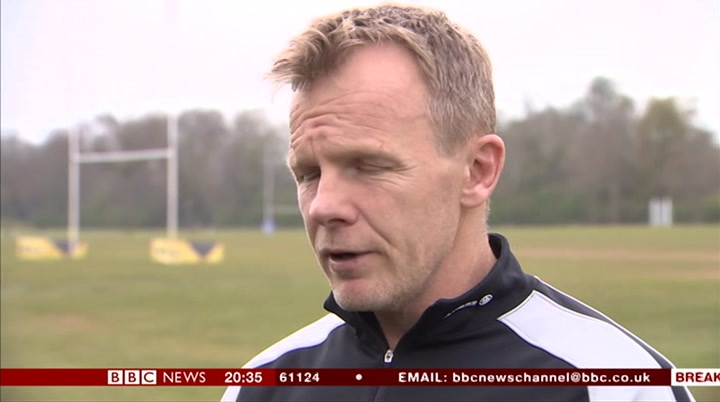 tom edwards reports. just after midday and on day two, the met moved in and tried to clear waterloo bridge. many refused to move and arrested. regrets? no, no, it needs to be done. why? because the planet's in crisis. the protesters are very organised. they called for more of those willing to be arrested to turn up via social media. they call them arrestables. it's all part of this campaign of civil disobedience. the met have issued a section 14 order on this protest. it means they can get the protesters to move on or arrest them. so far, there have been many arrests here on waterloo bridge. earlier, the bridge had been peaceful. 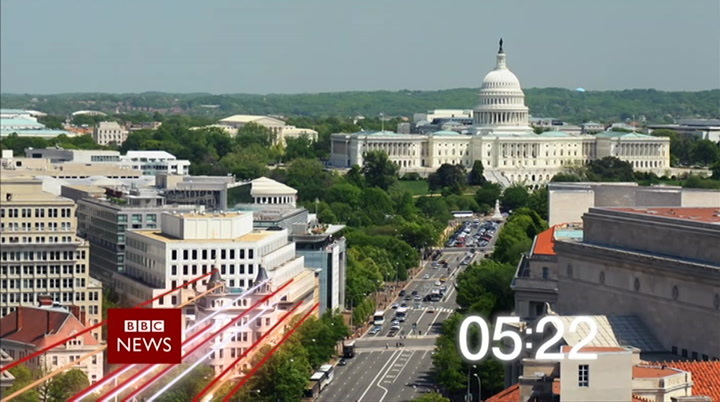 here, they want the government to declare a climate emergency. we've got children, we have grandchildren. we are sick with worry about what they are inheriting. we have got to change, now. it's a really serious matter. we need to get the government to listen to us and start telling the truth and acting on climate change. if the only way to do that is to get arrested, then that has to be done. 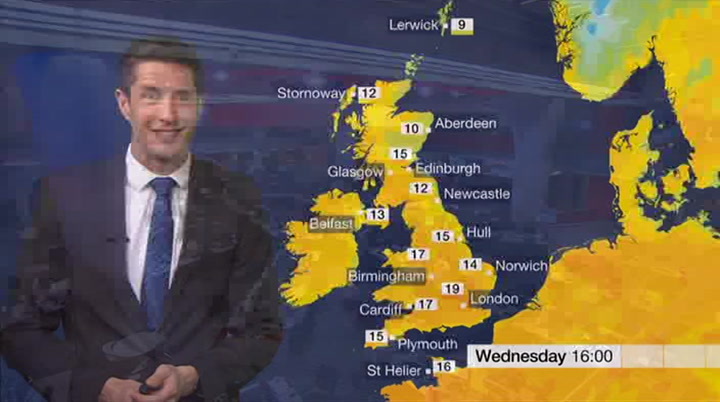 at the weather with chris fawkes. our weather will be turning much shinier and much warmer over the next few days. you might remember we started out the week like this with temperatures in the afternoon around eight celsius. but if we fast forward to what is in store this weekend, it will be really quite warm. temperatures into the high teens or low 20s and peaking of around 24 or 25 degrees. much warm weather is just around the corner. 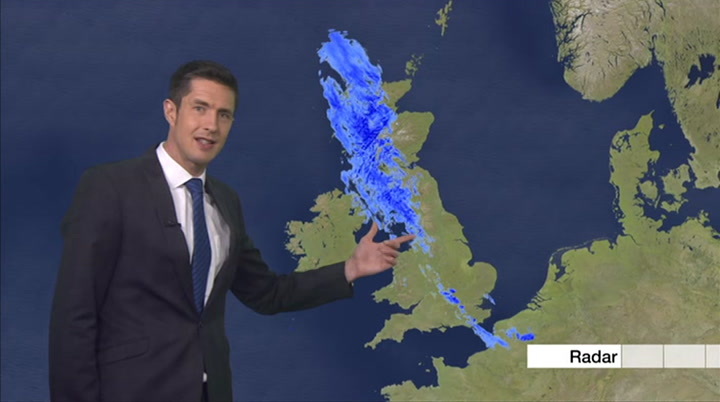 through the rest of the night, a bit of rain left over from our weather front bringing some wet weather through the uk during tuesday. that ring tends to become lighter and patch year. otherwise a lot of cloud around and some mist fog patch is forming over the hills, so for some of us it will be quite a great start to the wednesday and with the cloud and mistand to the wednesday and with the cloud and mist and fog slowly lifting and breaking we will see more in the way of sunshine heading to the afternoon. 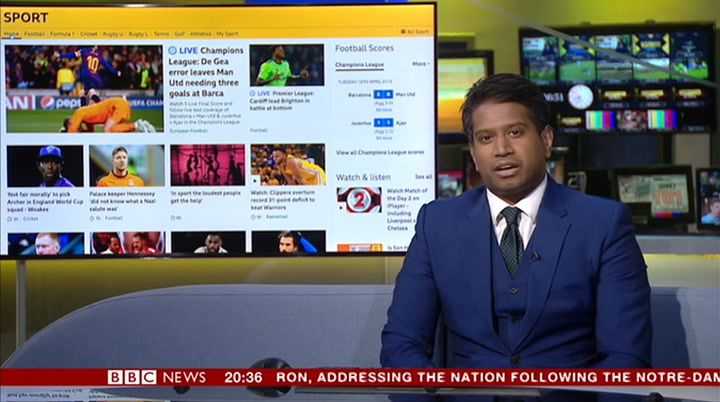 in that sense on itjust felt warm with temperatures reaching a high of 15 but 19 in london. 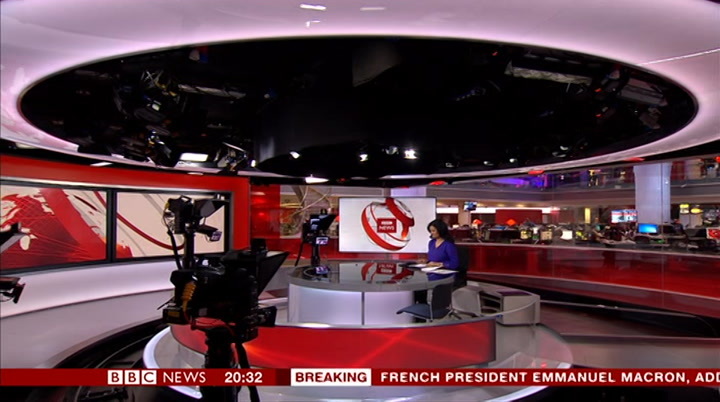 hello this is bbc news. 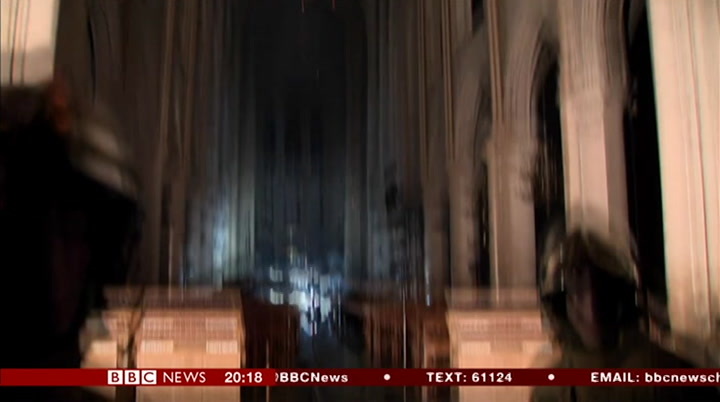 the headlines... hundreds of millions of euros are pledged to help rebuild the famous gothic cathedral — an investigation is underway to find out what caused the blaze. 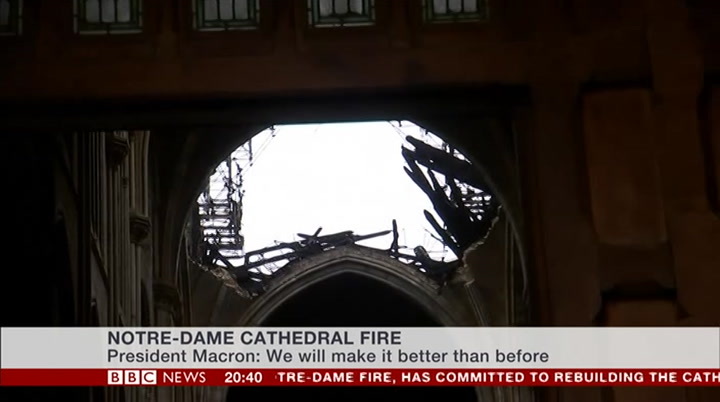 there's relief that so much of the 850 year old structure survived — the french president emmanuel macron vows to restore the historic building. we are people of builders. we had so much to rebuild. yes, we will rebuild the cathedral of notre dame and make it even better than before. 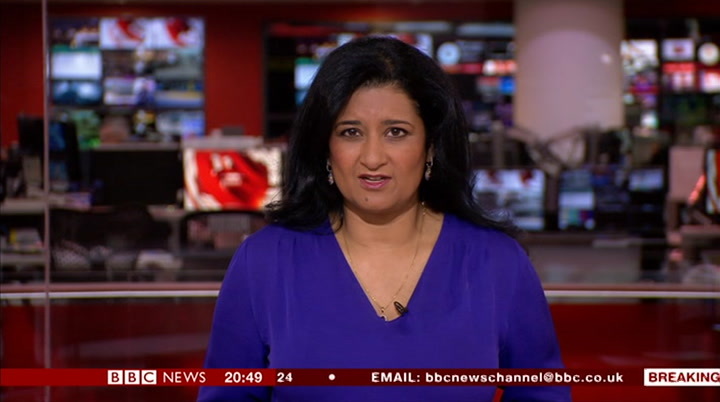 labour wants to abolish tests in primary schools in england — saying children should prepare for life notjust exams. more than 120 climate change activists are arrested for blocking roads in central london — amid protests aimed at shutting down the capital. of melting lead and burning timber. initially i saw the flames, looking at roof at the far end, above the gable and the flames were shooting out the peak of the roof there, and gradually the lead was melting further back so the hole was getting bigger. as the roof began to fall, some of the big bosses from the vault started thumping on the ground. you were inside at this point? yes. and everything you are looking at, tonnes of lead, oak, all went crashing to the ground that night. 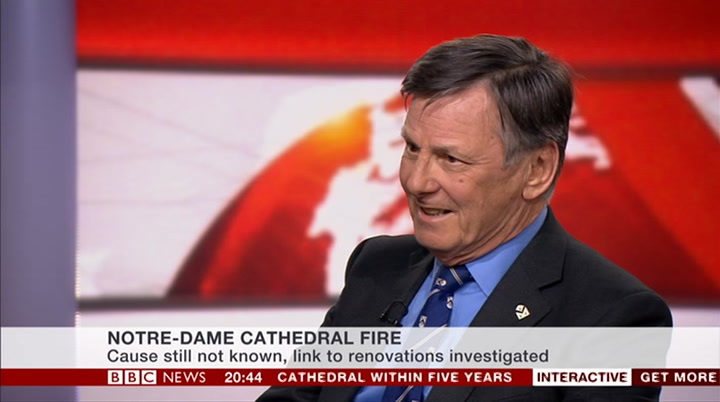 and what is amazing is that, 35 years on, you'd have absolutely no idea there was a fire here. he took me on a tour past the new grotesques and gargoyles, a reminder of how much can be restored, but also of the scale of the job facing the craftsmen of paris. it is a hugejob. i know when i was buying stone in france for the canterbury cathedral and i've met many masons in france, and i've met many masons in france, andi and i've met many masons in france, and i do know they have tremendous skills there. i don't know so much about carpentry but i do know the masonry is excellent. 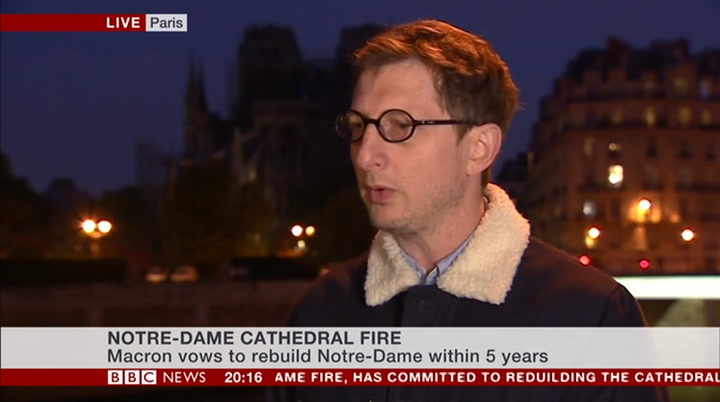 i know you're very expert and great churches what makes notre dame so special?” very expert and great churches what makes notre dame so special? 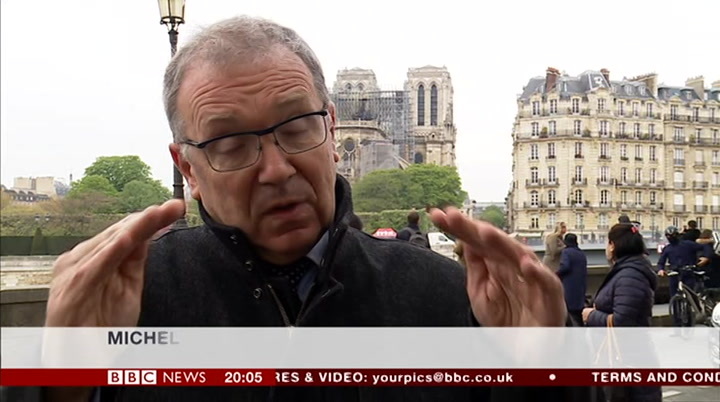 i think it's the french history, which it contains, that worship, that continues worship and the french people have focused on that building for centuries. it's their focus, people have focused on that building for centuries. it's theirfocus, i think that's the most important part of it. john, thank you forjoining us. 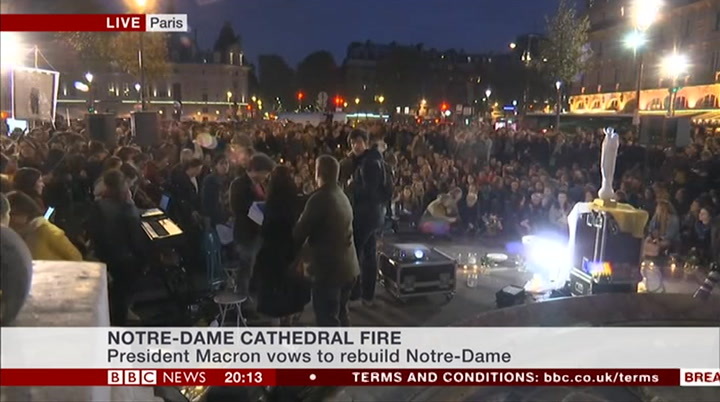 they want to show you a few pictures from the vigil going on still in paris and a much that was going through a memory of notre dame. let's just listen to some of the music being played there tonight. suffered serious injuries after he was sprayed with ammonia fluid while answering an emergency call in darwen in lancashire. a number of officers had forced entry to a property after a call reporting a domestic incident. 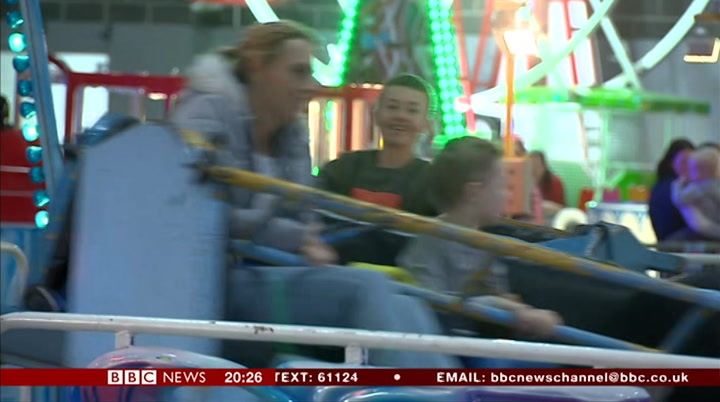 they were sprayed with what is believed to be a cleaning fluid. the alleged attacker climbed through a first floor window and was arrested a short time later. a police sergeant suffered serious injuries and remains in hospital. 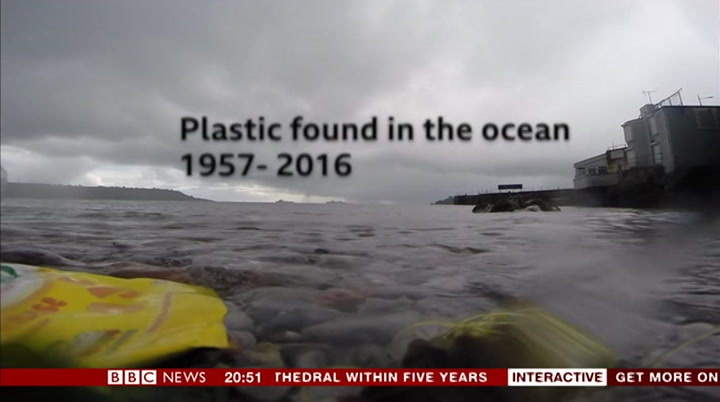 scientists in plymouth have found the earliest evidence of plastic litter in the ocean — a plastic bag that became tangled in a piece of research equipment in 1965. the finding is part of a study that has tracked the entire history of plastic in the ocean — revealing just how much more plastic has accumulated in the sea in recent decades. 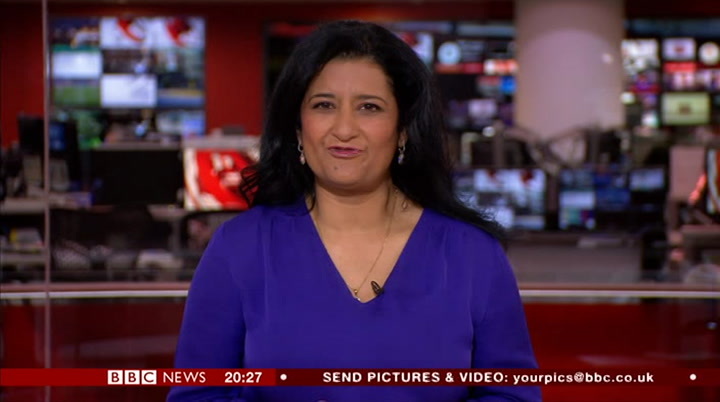 our science correspondent victoria gill reports. a mission beneath the waves. for decades, scientists have been measuring the health of the ocean by collecting plankton, the most important link in the marine food chain. 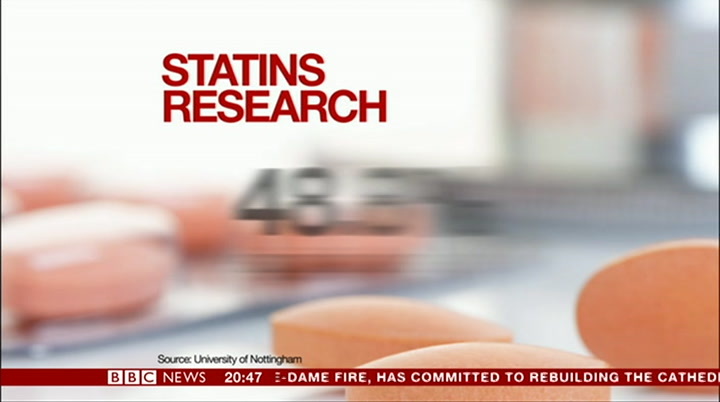 increase significantly. the number of plastic bags found has decreased in recent years although it is not clear that is linked to campaigns to phase them out. 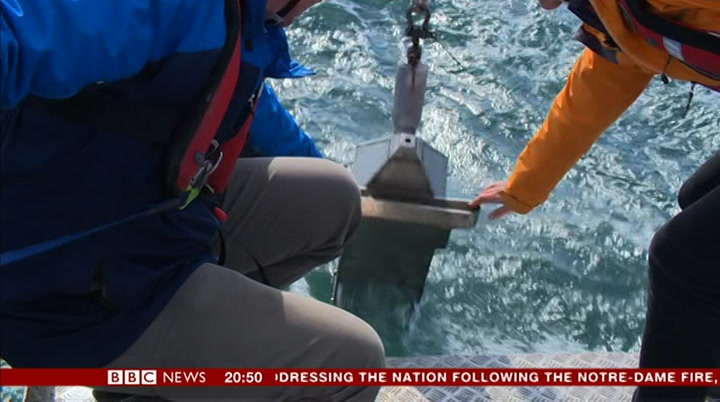 when one of the recorders in the fleet has finished its mission it is brought back to plymouth and here researchers continue to add to our library of samples they have gathered from all over the world. you walk across a story can find samples from back in the day they don't think about those and plastic is at the that's typical example so i like to think of the ever putting in here, some bright sparks go through university and just being bored now —— bar now and applying amazing science to what we are speaking now. as many of us as possible to act as citizen scientists, gathering information about the health of our woods. it's basically to encourage as many people to get out and enjoy forests and be involved in surveying for us. and there are events going on in forests all over england between now and the end of october. ok, so we're going to take a photograph of this moth. there's even a smartphone app called inaturalist so that people can identify the wildlife, plants and insects they discover. research scientists play a valuable role in telling us about our ecology, our environment and indeed what's changing, but by doing something like this, citizen science, the amount of evidence gathered together is absolutely huge. that provides a real snapshot of the state of our countryside. 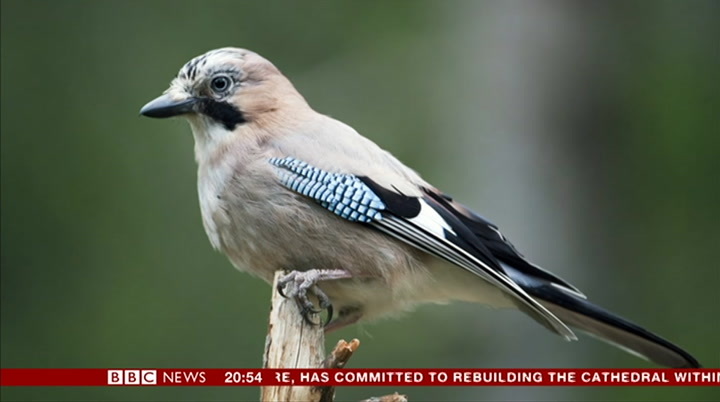 the project continues until october and it's hoped will replicate the success of the rspb‘s big garden birdwatch. but by understanding more about what's happening in ourforests now, measuring which species are under threat, decisions can be made on how best to protect them for the future. 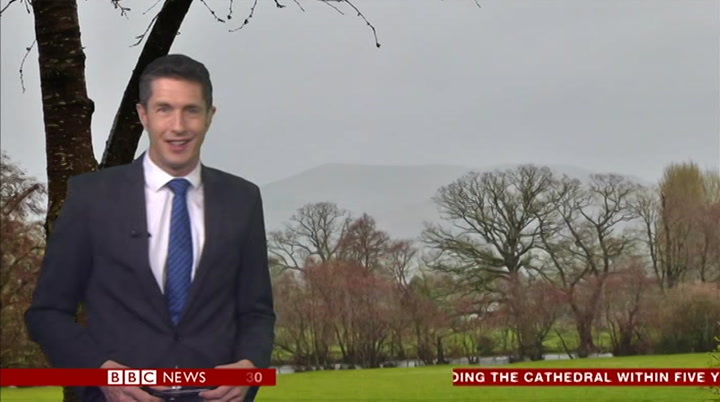 john maguire, bbc news, gloucestershire. 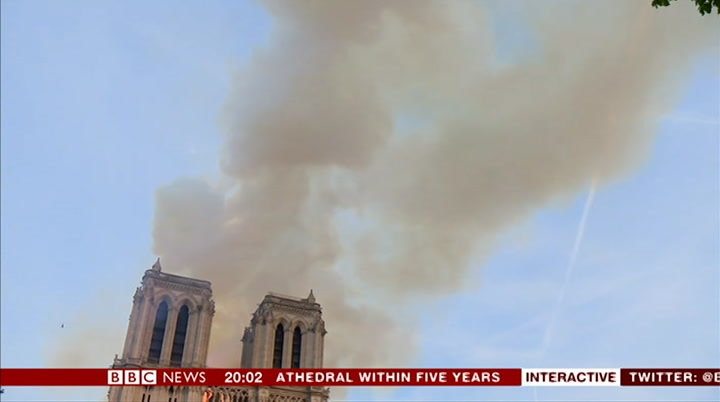 in a moment the weather with chris fawkes — but there's relief this evening in paris that notre dame hasn't been completely destroyed — and, donations are flowing in to restore the building. 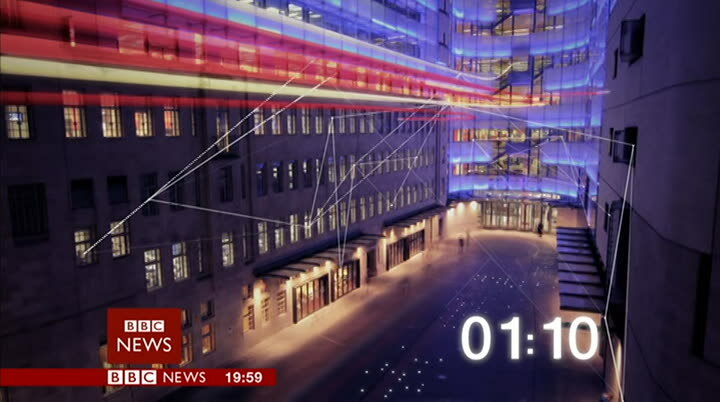 we'll leave you with images of how it all unfolded. singing. to come on thursday with high—pressure estelle influencing the weather, with wind coming in from the north sea always around that coast, and will be capped at that coast, and will be capped at that cooler and fresher but come in lynn, temperatures continue to rise and we see highs of 20 and 17 in edinburgh. 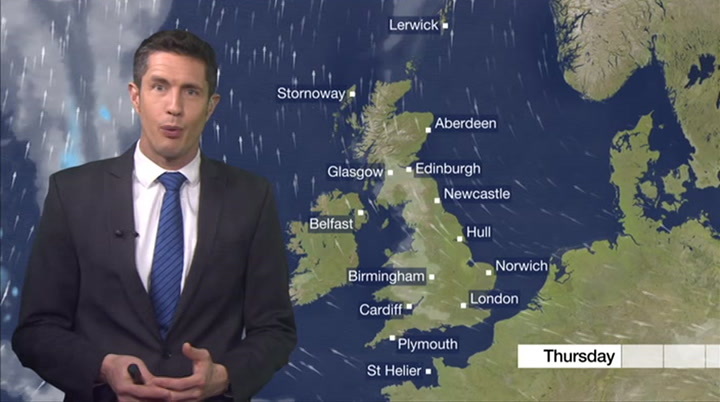 good friday ends the week like this with plenty more of that tried to come, temperature is widely getting into the high teens and low 20s, so pleasantly warm and sunshine for many on friday but some of the east coast will be cool and fresh. 14 aberdeen, la from the wind, 21 is at the top temperature and edinburgh, colder —— warmer and saturday, i trained for the cooler and a threat of rain on monday.